At Wiz we incentivize each of our employees to cultivate ethics, respectful and professional relationships amongst peers, clients, business partners and with society. Our mission is to ensure the highest levels of corporate integrity in all our activities. 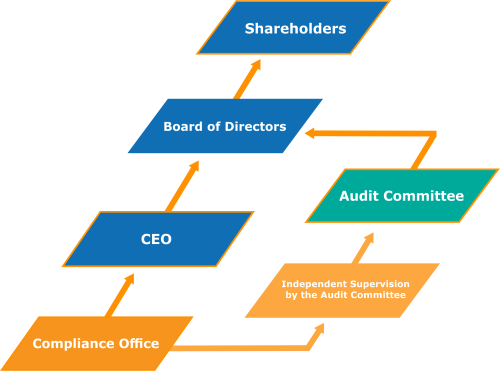 Our Compliance Office is supervised by our Audit Committee, which in its majority is formed by independent members, guaranteeing that the Office can perform with the necessary autonomy. O Wiz‘ Code of Ethics and Conduct was entirely revised and approved by the Board of Directors in 2016, being it one of our Integrity Program core pillars. In it are set forth the main behavior guidelines of what we expect from our employees, as well of what we do not tolerate. In the same document, we reaffirm our commitment to the combat against corruption, whether private or public. Intending to facilitate and make the understanding of Company‘s foremost rules more effective, we created the Compliance Booklet, in which are presented our Code of Ethics and Conduct main rules in a more didactic and objective manner. Additionally, we have internal policies for specific topics, such as (i) hiring process of suppliers and third parties; (ii) institutional donations and sponsorships; (iii) information security; (iv) Fraud and Corruption Avoidance and Tackling Policy ;amongst others. To access Wiz‘ Code of Ethics and Conduct, click here. To access Wiz‘ Compliance Booklet, click here. To access Wiz‘ Fraud and Corruption Avoidance and Tackling Policy, click here. We make available for all our employees, stakeholders, suppliers and general public an exclusive channel to receive reports and complaints regarding violations to Company‘s Code of Ethics and Conduct or any of its internal policies, as well as wrongdoings or illicit acts committed by any of our employees. Our Ethics & Compliance Hotline is anonymous and managed by an independent and specialized company. The Hotline is available 24/7.